"To merge or not to merge?" Diff Commander and Visual Comparer is an easy formula for you to solve the problem of comparing and synchronizing folders and files! These two programs together can really make an easy solution of the problem of visual comparing and synchronizing your folders and text files contents. We hope that our products will help you with your daily work! 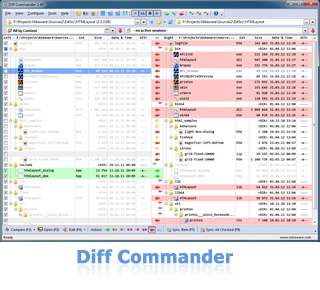 Diff Commander is a solution for visual comparing and synchronizing of folders and files. With Diff Commander, your data can be visually synchronized between computers or to the LAN, FTP, FTPS, SFTP and to many kind of disk devices - USB disks, optical drives (RAM) and others. Moreover, Diff Commander can compare archives files of many types (zip, 7z etc.) and interpret them as folders while comparing and synchronizing. Diff Commander can create a snapshot for synchronization of your data between two computers which have no a direct connection with each other (for example, between office and home computers). Visual Comparer is a software utility having text files and files of special formats comparison as the main feature. Visual Comparer allows you to load text files for comparing, perform matching and merging operations as well as to edit the text as if it were a fully-functional text editor. 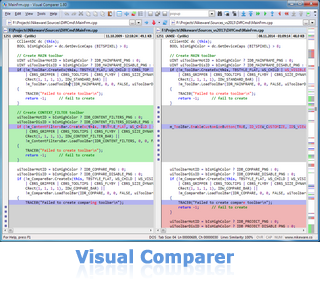 Visual Comparer is intended mainly for software and web site developers who require a special text editor with syntax highlighting and visual comparing feature. It is a great match for Diff Commander! After comparing two folders you can compare different files more thoroughly. Just run Visual Comparer from Diff Commander for such files! New versions of Diff Commander and Visual Comparer. SFTP and FTPS (FTP over SSL/TLS) support added to Diff Commander. Many new archive files now you can open and synchronize with Diff Commander! See what's new for more details.